Your list of things to see and do now includes Madison Square Garden, The Lion King, Chelsea Market, and other attractions. Escape the urban bustle at East River Waterfront Esplanade and Roosevelt Island. 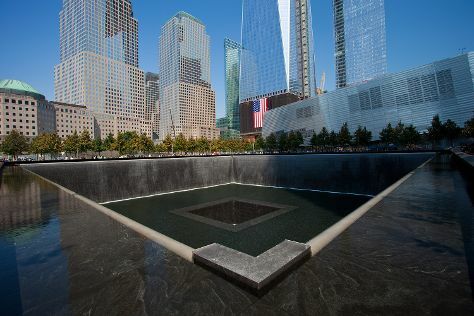 Do some cultural sightseeing at The Metropolitan Museum of Art and 9/11 Memorial. There's lots more to do: go for a walk through Times Square, make a trip to Central Park, take a stroll through Fifth Avenue, and explore the world behind art at The Museum of Modern Art (MoMA). To see reviews, other places to visit, maps, and other tourist information, read our New York City trip maker tool . Sao Paulo, Brazil to New York City is an approximately 14-hour combination of flight and bus. You can also fly; or do a combination of bus and flight. The time zone changes from Brasilia Time to Eastern Standard Time, which is usually a -2 hour difference. Plan for colder temperatures traveling from Sao Paulo in February, with highs in New York City at 9°C and lows at -1°C. Finish your sightseeing early on the 12th (Tue) to allow enough time to travel to Orlando. Appreciate the collections at Charles Hosmer Morse Museum of American Art and NASA Kennedy Space Center Visitor Complex. Visiting Discovery Cove and Disney's Animal Kingdom will get you outdoors. Get out of town with these interesting Orlando side-trips: Valiant Air Command Warbird Museum (in Titusville) and Stetson Mansion (in DeLand). Have a day of magic on the 15th (Fri) at Walt Disney World Resort. Pack the 17th (Sun) with family-friendly diversions at Universal Orlando Resort. The adventure continues: find something for the whole family at Universal's Islands of Adventure, have some family-friendly fun at The Escape Game Orlando, and discover the magic at Happily Ever After Fireworks. To find photos, ratings, maps, and more tourist information, refer to the Orlando travel route planner. Getting from New York City to Orlando by flight takes about 6 hours. Other options: do a combination of bus and flight; or drive. Expect much warmer temperatures when traveling from New York City in February; daily highs in Orlando reach 28°C and lows reach 15°C. Cap off your sightseeing on the 18th (Mon) early enough to travel back home.